Bloggers do need to have a social media account - personal or not - for many reasons. It is important that we also make it look at least inviting for our readers and if you can we should also make a trademark on our social media accounts on these social media websites so that people and especially your readers can easily tell that it's YOU and/or your blog account. They could tell the difference between other blogs or sites and you through making that stand out look online. The problem of some designers and some people who would like to create a customized image for their accounts is that the image sizing for the social media accounts. From Facebook covers, Twitter back drop, or Google+ covers, etc. they have different sizes that they require so that your image will be the exact fit and will look great when your readers and fans sees it. 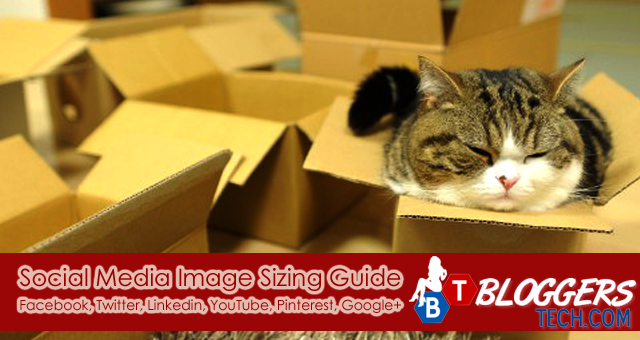 I found this infographic from ORIGINAL GINGER wherein it has all the major social media image sizing guide and I would like to share it with everyone here in Bloggers Tech. So obviously in this guide you'll find the sizes for Facebook cover, Facebook profile picture, Facebook favorite app, Twitter Background, Twitter profile image, Linkedin avatar or profile image size, Linkedin banner size, YouTube channel avatar size, YouTube channel background, Pinterest avatar, Pinterest maximum image size for pinning, Google plus single banner and Google+ profile image, and of course Google plus company page banner size. Hopefully soon I'll be able to include this in my services wherein I could create and design this for you. But with my busy schedule and the pricing for this - since I have to make it affordable too - it's quiet complicated.